The broad themes of Trade, Industry and Empire can be explored in several ways, depending on the age group of the children and whether a half or whole day visit is required. The small holding forms the agricultural background to discuss the changing fortunes of farmers. Britain became the “stockyard of the world” sending British breeds of cattle and sheep to the colonies in Australia and New Zealand and to the pampas of South America. The import of cheap cereals, corned beef and frozen lamb from the colonies subsequently under-cut the cost of domestic production. Industry was an integral aspect of even country life. The rural landscape of Weardale, where the smallholding is situated, also supported lead mines, stone quarries, coal mines and iron works. The lead miners, in particular, were miner-farmers, and the lifestyle of the women and children running the farm can be contrasted with the men working in the mines and only coming home at weekends. Railway lines carried the products of the mines and quarries to cities and ports and also took farmers and livestock to market. The livestock marts at Darlington and Northallerton are still situated next to the railway, since these were built by the Victorians. These market towns stocked mass produced goods, such as china and glass ware made in Sunderland or Tyneside, which were used throughout the Empire. The British Empire prospered and goods which were rare and expensive in Victoria’s grandparents’ day, for example tea, sugar and cotton, became cheap and commonplace. Such trade patterns with the colonies can be linked to the geography of the Empire. Spiritual well being, both at home and in the colonies, was of great concern, with the publication of many religious moral and improving tracts. Sunday Schools helped disseminate such literature. Educational reform in the 1870’s established national compulsory education of young children. This can be contrasted with the previous employment of such school-age children in mines and factories. Christmas became a very special time, after Charles Dickens published “A Christmas Carol”. The Christmas tree, Christmas cards, new Christmas carols, Christmas crackers and Father Christmas were all popularised by the Victorians. There are lots of toys to play with, that good Victorian children might have been given, and simple party games to play. These themes can be explored by a “day in the life” approach to either the farmer’s or lead miner’s wife or to that of a maid in service. For an afternoon visit, the theme of “afternoon tea” can be linked to a moral story entitled “The Tin Teapot”, which promotes the virtue of thrift in comparison to the ills attending on a lifestyle based on credit. The presentation will centre on a wide range of real and reproduction artefacts, many of which will be passed round for the children to handle. The children are actively involved throughout by a question and answer approach and activity breaks. 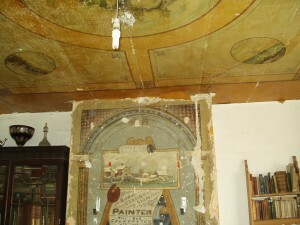 Depending on the age of the children and the option selected, activities can include handling and counting real Victorian money and calculating how many pennies in a shilling and a pound; writing in ink with quill pens; handling and silent reading of real and reproduction Victorian books; peeling rushes for rush lights; playing with reproduction toys. 2012 is the 200th anniversary of Charles Dickens’ birth. A Christmas Carol is one of the popular stories by this prolific author. In this tale, the Spirit of Christmas Present takes Scrooge to visit the family of his clerk, Bob Cratchit. On Christmas morning, Bob has gone to church and returns with Tiny Tim upon his shoulder. 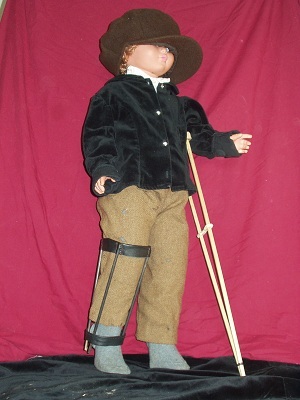 Alas for Tiny Tim, he bore a little crutch, and had his limbs supported by an iron frame! His active little crutch was heard upon the floor, and back came Tiny Tim before another word was spoken, escorted by his brother and sister to his stool before the fire. He sat very close to his father’s side upon his little stool. Bob held his withered hand in his, as if he loved the child, and wished to keep him by his side, and dreaded that he might be taken from him. The story of A Christmas Carol can be used to introduce themes of the Victorian Christmas, such as the contrast between rich and poor; festive dining, particularly the Cratchit’s Christmas Dinner; home entertainments; health, with regard to Tiny Tim. 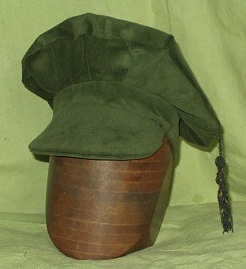 A selected range of artefacts forms the basis of a talk on the duties of the farmer’s wife. Livestock can be added to the display of agricultural artefacts. Food preparation can include plucking a bird. If the firebox is permitted, items such as oatcakes and drop scones can be cooked on the girdle and a contrast made between a working “kitchen” display and a “tea-table” display of artefacts. 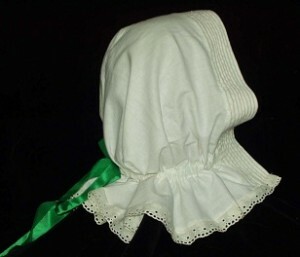 Victorian sunbonnet from a pattern produced by Weybridge Museum.